Here’s something you can’t control: a coup d’etat! I am happy to report that I am almost finished with my new book, tentatively entitled How to Be a Stoic, to be published by Basic Books next year. I’m even happier to report that I have experienced a coup d’etat with no damage, either physical or emotional. Let me explain. 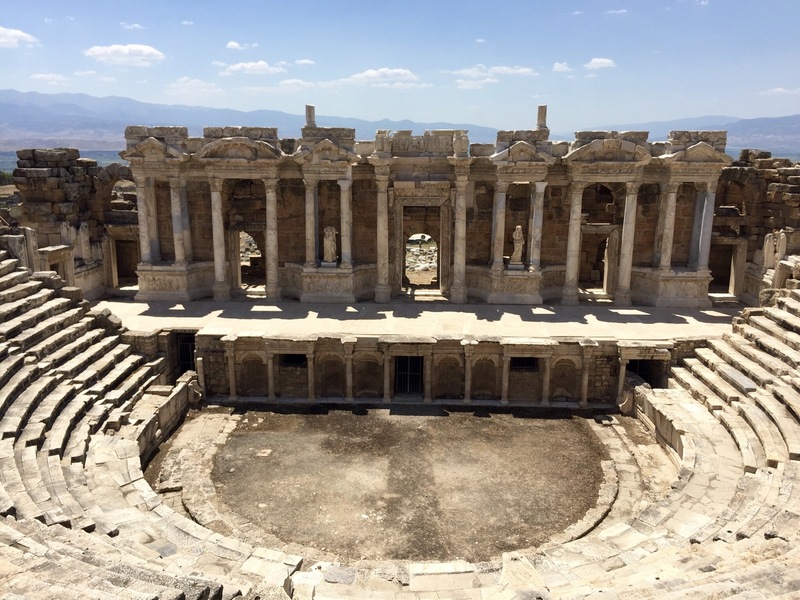 As part of my research for the book I went to modern day Pamukkale, in Turkey (see image of the spectacular theater there), a UNESCO World Heritage site that contains the ruins of Hierapolis (literally, holy city), the birthplace of Epictetus. You see, my book focuses on the slave turned philosophy teacher, imagining a conversation between me and him, based on the Discourses, which I use to explore a number of aspects of Stoicism and how they apply to modern living. Since I talked my companion (and a close Turkish friend) into coming with me, we turned the trip into a two-week long vacation during which we explored many of the archeological sites of southwestern Turkey (besides Hierapolis, we visited Aphrodisia, Ephesus, Laodicieia, Didyma, Miletus, Priene, Pergamon, and Izmir), and even went as far as Cappadocia (I really recommend the balloon flight over its rugged landscape, at dawn, even though it has nothing to do with Greco-Roman history). We then spent the last three days in gorgeous Istanbul, despite the misgivings of some family members, who pointed out that the city had been the site of a terrible terrorist attack just days before we made it into the country. But, we reckoned — correctly, as it turned out — that the likelihood of another attack so close in time, especially with the predictably heightened security following the first one, would make for an acceptably low risk. However, what we didn’t take into account was the likelihood of a coup d’etat, even though Turkey has seen four of them since the 1960s. Well, five now, if we count the one we experienced the day before leaving. The setting was somewhat surreal. We were having dinner with a couple of locals at a wonderful Cretan restaurant in the historic district of Istanbul while I noticed that everyone at a nearby table, one of the few still occupied late in the evening, was intensively looking at their phones. My immediate interpretation was that I was witnessing yet another example of the damaging effect of modern technology: these people would rather check Facebook than talk to their dinner companions. But it soon became clear that I should have denied assent to that first impression, since they were both too engrossed and too visibly concerned for that explanation to be correct. No, they were following the news of an unraveling coup d’etat. The reaction at our table was remarkably calm. We finished the wine and kept chatting, while our Turkish friends caught us up with the history of such things in their country, as well as the most recent developments of the current political situation, including the increasingly authoritarian and strongly pro-Islamic government of prime minister Recep Tayyip Erdogan. So we hit the streets, looked for a cab, didn’t find one available (of course), and eventually cautiously approached the bridge on foot. We saw police cars blocking some streets, and heard fighter jets flying overhead. The good news was that social networks were still up (they never went down, in fact), so we could reassure our families that we were okay, for now. Puzzled, we reached our hotel and retired for the night. 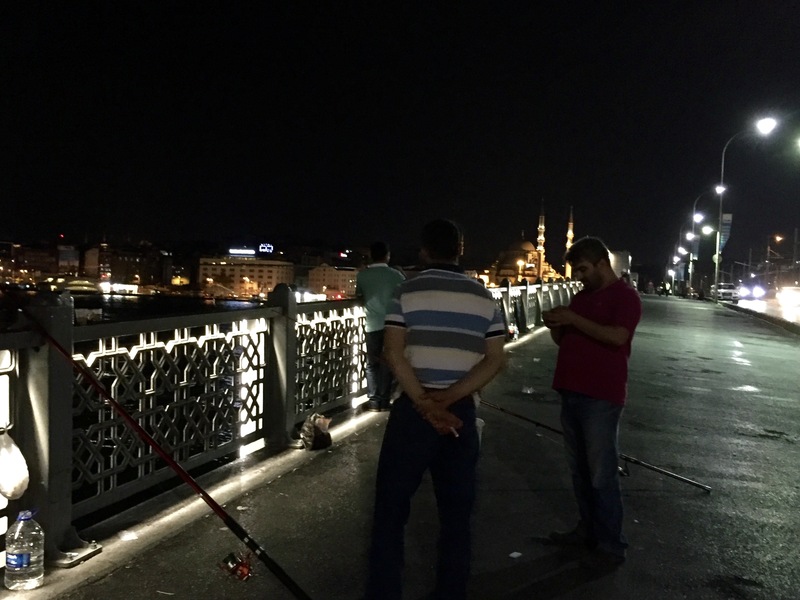 Over the next several hours we kept listening to helicopters and fighter jets overhead, accompanied at one point by two loud explosions which turned out to come from nearby Taksim Square. But when we woke up in the morning things appeared to be almost normal, with people in the streets (though not as many as usual), and coffee houses open (though not many museums). The airport hadn’t reopened yet, so we kept a low profile, walking the neighborhood and just reading and keeping an eye on the news until we were told that our flight had been changed but was on. We were to make it to the airport around midnight, headed for Paris and then New York. As a general rule, it is not a good idea to be blocked in traffic in the midst of a frenzied crowd, especially when you don’t speak the language. When such crowd is made of mostly young men excited at the blood they saw in their own streets, that’s even more of a dispreferred indifferent. And you definitely don’t want to see your taxi driver starting to shout to another driver out of frustration for not being able to move forward. At any rate, we did make it to the terminal, checked in, and safely got back to Europe first and the US next. So what did I learn, as a prokopton, from the experience? This was first and foremost a very strong reminder that few things are under our control. It’s something we remind ourselves everyday and try to keep in mind, but there is nothing like a sudden overturn of the social order to forcefully bring the point home. Second, I was surprised at how calmly my companions and I actually behaved throughout those 24 hours in Istanbul. True, we were never in any apparent physical danger, but the situation was definitely uncertain, and especially once we heard explosions and military planes overhead a bit of anxiety would not have been entirely out of place. I do credit at the least part of our reaction to practice of or familiarity with Stoicism (my Turkish friend is a practitioner, and my companion has certainly heard more than enough about it from me, over the last couple of years…). But of course this was not a controlled experiment, so to attribute causality with nothing other than a hunch is not advisable. Third, especially while driving through the chanting crowd at the airport I was reminded of just how easy it is to emotionally manipulate people, particularly playing on their fears and anger. It reinforced the Stoic (and Epicurean, to be fair) idea that such emotions should never be given assent, but always kept in check in favor of the development of more positive attitudes, like an attempt to rationally understand why things are happening and where one’s country is headed as a consequence. This entry was posted in Modern Stoicism on July 26, 2016 by Massimo. 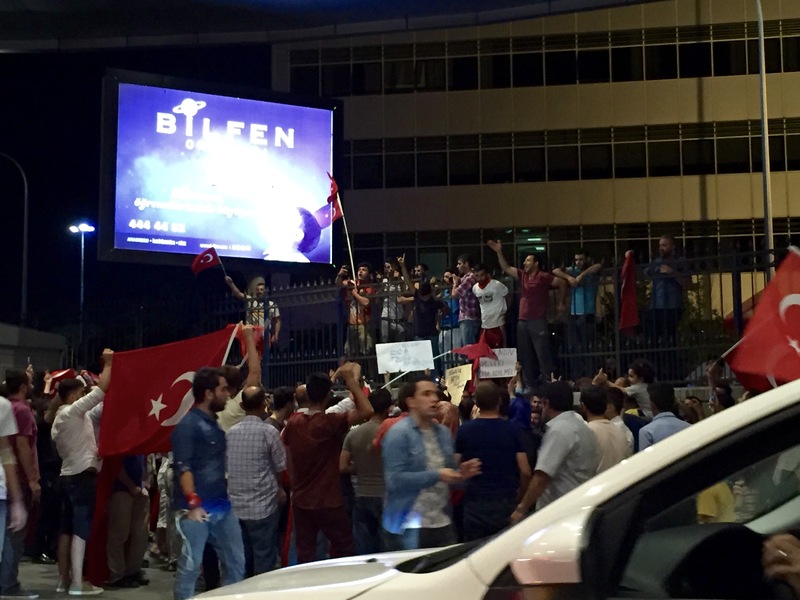 Erdogan claims that his critic, Fethullah Gülen, was somehow behind the attempted coup. If so, that represents a significant departure. Previous military coups have been, at least nominally, in defence of secularism against Islamism, but if Gülen really was involved on this occasion, then we have the first example of the Turkish military acting on behalf of one Islamist group against another. On the other hand, it may simply be that Erdogan is using this Reichstag Fire moment to silence as many of his critics as possible. How, as Stoics, can we best prepare ourselves for the possibility of a Trump presidency? Well, a Stoic would prepare himself for a Trump Presidency the way he would face any other externality he cannot control: you accept the fact and then try your best to practice the four virtues within the new constraints imposed by that fact. And just so to be clear that Stoicism doesn’t imply passivity, Stoics have plenty of role models to invoke when it comes to political opposition, like Cato’s resistance to Julius Caesar. Fascinating story. Thank you for sharing it. Glad you and your friends are all safe! Important point in our time! In group C at SLAC we had a Turkish grad. student. Last I heard he was a Prof. at a major Turkish University. He would dislike Erdoğan. I’ll have to try to find out if he’s ok.
Will we soon be having to try to find jobs refugee Turkish scientist? I’m supprised Erdoğan han’t changed it. It might even have played a (minor) role in DASH target selection. Which to ramble on brings me to another pet peeve: All our airport security has only served to create a big fat target, called the security line. The terrorist seem to have caught on to this ;(. I can’t wait for your book to come out (well yes I can, I do practice Stoicism after all LOL! ), it certainly will be an interesting dialogue. Thanks for sharing your experience in Turkey. Although I would never wish anyone to go through something like that, it must have been interesting to view such an event from the Stoic perspective and to live the philosophy in a potentially life threatening situation. Be well. Hello Massimo. I’m a Turkish citizen and live in Turkey. Your words about Hierapolis made me very curious. Lately, two of my friends visited there and they were fascinated by the city. After reading your post, İ plan to visit there at the weekend since it’s just 2 hours away. I look forward to read your upcoming book. I used to hate philosophy but after reading M. Aurelius’ Meditations by accident thinking that it’s a biography of the emperor (I’m very intersted in the history of Roman Empire), my life has changed dramatically. The book gave me the exact guidance that I needed most. Now I’m reading Epictetus and Hierapolis will be the perfect space to read it. I have a question for you: I read the works of Senece. After reading Epictetus, I’d like to read Musonius Rufus. But his book has not been translated into Turkish. I can read and understand most of the things in English except the pieces that have old English words. Also, I am not familiar with philosophical terms. Dou you think, I wiil have difficulty understanding Musonius Rufus? Thanks in advance. I really enjoyed reading your account of your experience. The people fishing from the bridge should be awarded the Stoics of the Day award! “It was time to fish so we fished.” I, too, look forward to reading your upcoming book. You hooked me into stoicism with your radio interview a year ago and your FB postings and blog keep me engaged with a philosophy that essential for me. This might be useful. If you can get a copy on Kindle and use the Kindle App for PC or Mac, it has a very nice feature that you can click on a word (or select a couple) it will give you the option to Google it. I’m trying again to read James Joyce’s Ulysses and I find Kindle lookup very useful as in Joyce’s ‘show off’ mode I find something I don’t understand on many/most pages. Using this I can get the jokes…if a bit slowly and actually manage to read it with some comprehension. Of course, w/o Kindle you can cut and paste from any electronic copy you can get into Google, but it’s a bit harder on the wrist. I got Mediations on Kindle for either nothing or 99 cents. I think most Greek/Roman philosophy is available at very low cost.